You’re smart. You’re a go-getter. You’re pursuing your passion of building a thriving business and really going for it. Yet most entrepreneurs never crack the 6-figure ceiling. Too many of those wanting to make a difference end up struggling. Of those who do make it into 6-figure territory often only do so by working their fingers to the bone. They may have a ton of clients, but they’re a slave to their business… and it’s certainly not the follow-your-bliss kind of business they’d envisioned creating. Over the next several weeks, I’m going to share with you the big mistakes that almost every passionate entrepreneur like you is making that keeps you stuck earning way less than your potential and infinitely less than you deserve. I’ve also packed in the answers to how you can stop making these mistakes and finally start creating 6-figure income consistently without burning yourself out. The good news is that the problems you’re having with your business – the reasons your business isn’t working like you’d hoped – are totally solvable. You won’t need any complicated software or expensive new website. What you WILL need are proven strategies and step-by-step processes for leveraging your time, money, effort and talent. But, if you’re not yet where you want to be with your business, then you need to consider that what you’ve been doing – or how you’ve been doing it – simply isn’t working… and that it’s probably not ever going to get you where you want to be if you’ve already been trying for a while. And, is that what you want… to earn less than you can be and less than what you deserve? If it’s not, then this is for you. You’re charging by the hour or by the session. On its surface, charging your clients by the hour or by the session seems to make sense. After all, we’ve been trained to think this way: work is an exchange of your time and effort for a paycheck, right? When you got your first job, I bet you were paid by the hour. Most jobs are paid by the hour… even many highly-paid professionals like attorneys charge by the hour. Fundamental Truth #2: Your clients will start to get far better results when you shift out of charging by the hour or session. Really! But what it takes is a total mindset shift. HOW you charge will determine your income as much as WHAT you charge. Let’s talk about Fundamental Truth #1. Think about it. In all honesty, if you’re working with your clients on a per-hour or per-session basis, do you want them to get to the point where they say, “Wow, my problem’s solved. Thanks! I don’t need you anymore… it’s been great working with you!” really quickly… or maybe not quite so quickly? But your client’s happy ending also means you’ve probably lost a client and need to replace that income… and if you’re charging low fees, too, then you’re really up a creek! Working like that keeps you a slave to the feast and famine cycle so many coaches, consultants, healers, spiritual leaders, speakers, authors, holistic practitioners and transformation business owners find themselves stuck in. Not to mention that charging by the hour or session presents an inherent conflict of interest, doesn’t it? It pits your client’s desire for super-fast and powerful results against your need for business income (so you can continue to BE in business). Maybe you secretly hope that your client doesn’t do quite so well so fast with your help. Maybe you unconsciously hold back a little so you’re not giving your very best to your clients and they need you a bit longer. But I bet you feel a little guilty either way. Yet I bet you have this little conflict playing out on a daily basis in your business, even if it’s hiding just under the surface. So, how do you resolve this conflict? Instead selling your clients a bit of your time, you sell them a specific result, which is much more valuable to your clients. Yes, I’m sure they do… AND they could be getting even better, faster and more highly-valued results, which would only make you look like a bigger hero in your clients’ eyes. Instead of worrying that you’ll be losing much-needed income when they no longer need you, by charging fees commensurate with the incredibly valuable results you get for your clients, you will have already been generously compensated for your work. Helping a client to soar without needing your attention will be more rewarding than ever because you won’t have any of the loss of income fears anymore! Plus, when you structure your services correctly, you don’t have to worry about clients leaving because they’ll be sending a flood of referrals your way! Your clients’ ability to get results is undermined when you charge by the hour or session. Let’s go back to Fundamental Truth #2 and why clients actually get better results when you structure your services around delivering a pre-determined specific result. The real reason your clients hire you is because they want to solve an urgent problem and attain a specific result. When your sessions consist of trouble-shooting whatever problem pops up that week, you’re rarely addressing the root cause of the problem. You’re offering your clients a temporary fix or micro-steps toward solving their true top-of-mind, urgent problem instead of offering them a real solution. The number one best way to help your clients more is by knowing their problem inside and out, identifying the highly-valued result or solution and taking your clients through a step-by-step system to arrive at the solution. Your clients will get far better results through your step-by-step, problem-solving system versus working via sessions that simply address your client’s problem-of-the-day or short-term challenge. What’s the first step of your “transformation system”? It’s offering your own signature premium program. Signature premium programs not only benefit your clients more, they make building your 6-figure business a lot easier. When you engage your clients solely in an hourly or by-the-session model, you are unknowingly diluting the power of the transformation you provide and undermining the results your clients are able to get. It’s HOW you structure and deliver your expertise that makes the biggest difference in the results your clients get. With the right “container” that has been specifically designed to account for the way human beings create change, your clients will create extraordinary results – sometimes even in spite of themselves! There are 10 program design elements that make the critical difference to your clients’ – and your – success. These take the pressure off you so you can feel completely confident that every one of your programs will deliver in spades. Plus, they empower your clients to create rapid change in their lives at the same time. When you optimally structure HOW you work with your clients, you give them a complete solution to their problems instead of temporary relief, so you’re actually helping them more. Your signature premium program takes how you work with your clients and systemizes it to consistently and predictably produce optimal client results and generous business income for you. By giving your BEST and helping your clients achieve amazing results, you can charge higher fees without hesitation and remain in full integrity. That’s also one of the keys to successfully selling your transformation services with ease and grace… and without any icky, high-pressure sales tactics or feeling like you’re begging for business. Now, let’s talk about how working with your clients on hourly or per session basis is dramatically jeopardizing your ability to create consistent 6-figure income without burning your candle at both ends. If you want to BE in business and STAY in business so that you can help a lot of people for many years to come, you’ve got to have money coming in the door… and the fastest and easiest way to do that is by packaging your incredible talents, unique life experience and compelling message into powerful, highly-effective premium signature programs. … Or you will always feel like you have to work way too hard to consistently create 6-figure income and like you’re on the fast track to burn-out instead of creating a business and life you love that serves your clients in the highest way. Let’s just do some quick math to show you how easy it can be to create 6-figures a year offering premium programs and working A LOT less. At $250 per session, you must book 400 sessions (clients) per year. At $100 per session, you must book 1,000 sessions (clients) per year. At $50 per hour, you’d need to work 2,000 sessions (clients) per year. So let me ask you, which looks better to you? In upcoming posts, I’ll continue to reveal mistakes I see so many ambitious entrepreneurs making that jeopardize their ability to create profitable and truly fulfilling 6- and 7-figure businesses. In the meantime, I’d love to hear your thoughts. Are you feeling burned out by your business? Do you charge by the hour or session... or have you already taken steps to leverage your time and expertise to earn a bigger income? 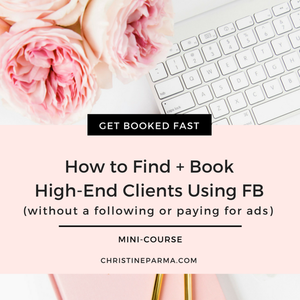 Quickly fill your calendar with committed, higher-fee clients! Together we’ll create your powerful Irresistible Offer you can share with prospects and current clients that supports you charging and getting higher fees today… and finally getting paid what you’re worth! Do you feel like you’ve been spinning your wheels trying to take your business to the next level? Are you ready to move up from barely “making a living” to having an incredible, highly profitable, purpose-led business that serves your ideal clients in the highest way? Imagine if all of the time, effort and money you put into your business finally paid off at the level you’ve been hoping for and you were working with dream clients making a generous income doing the work that matters the most to you! The critical key to making the leap from a frustrating business to one that generates 6- and 7-figure income is having a system for turning what you know into programs that high-dollar clients happily enroll in. Knowing how to create these kinds of programs the right way changes everything! This is the exact reason I created my 90-day private mentorship program, in which you're guided step-by-step through a proven system for creating and launching your own premium program and enrolling high-paying, premium clients with grace and ease. Click here to learn more about how to leverage your passion into 6-figure profit now!